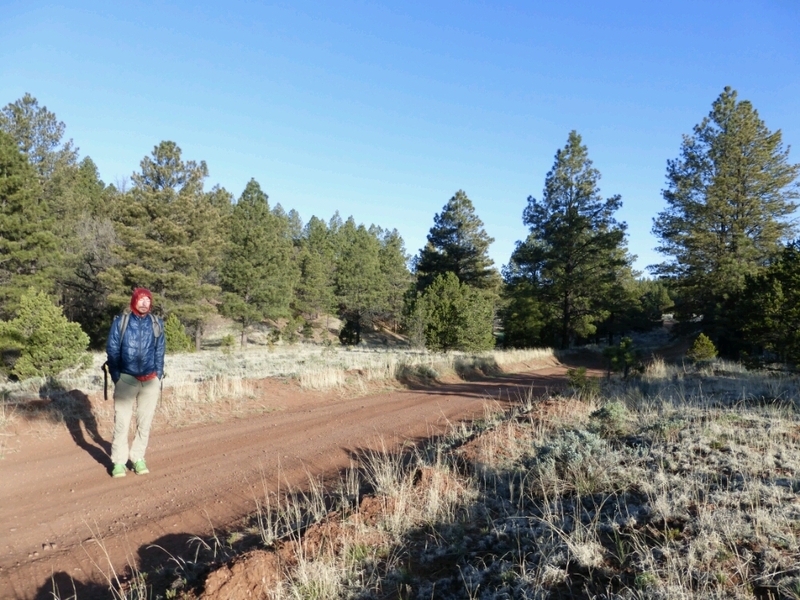 So far, during our hike, New Mexico has been colder than it has been warm. We woke to frozen water containers and frost on the tent. (Later we learned that the night had been below 27 degrees (F) in town. Brr. The only thing to do on these cold mornings is start hiking and find some sun. The brisk conditions have us walking briskly. Gabriel basks in the first rays of sun. 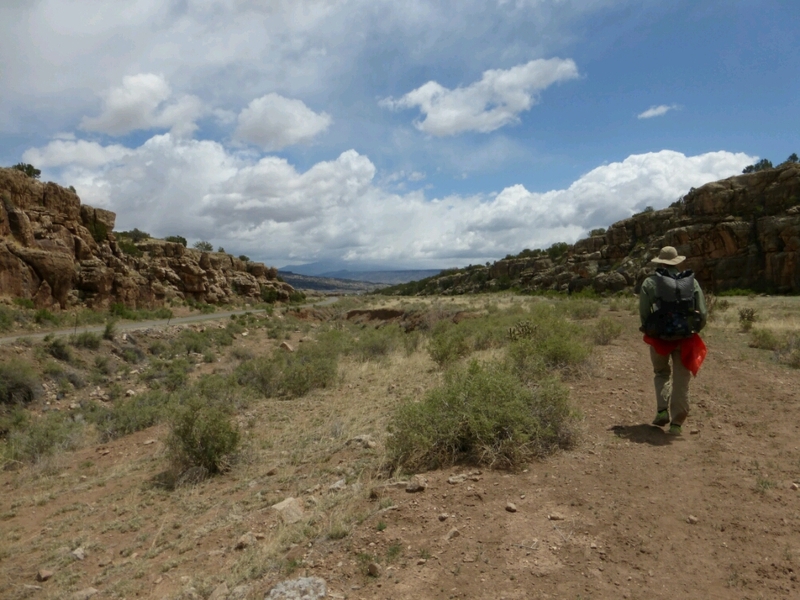 Today we are walking the canyon floor of the Zuni Mountains. Rolling hills 7500-8000 feet high comprised mostly of Ponderosa pines, some juniper and pinyon. Gabriel and I both note that they are greener and more dense than the forests of southern New Mexico. Confirmation that we are gradually walking northward. It’s also town day. We enjoy the walking but we are looking forward to Grants. Gabriel is hungry. I want to feel clean. Time for a recharge and to warm up. Time to get to Grants. More road walking, but thankfully along a good gravel road (FR 49). Sandstone cliffs and a few interpretive signs engage our attention. Alas, some of the signs and road markers have been shot up. Making them difficult to read. 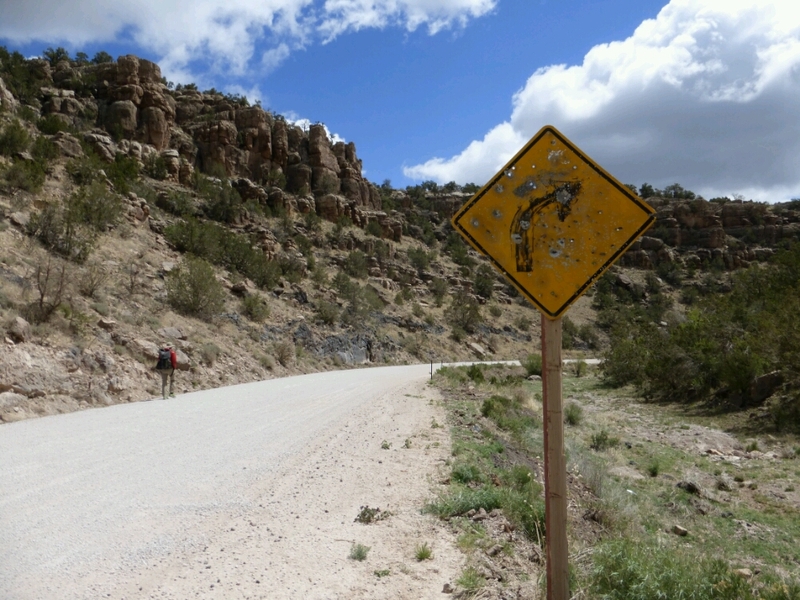 From beaten signs, we glean that the Zuni Mountains were railroad logged in the early 1900s. The old rail bed we see on our maps and with our eyes once had tracks and trains that hauled logs to Grants and then onto Albuquerque. Similar to logging at home. 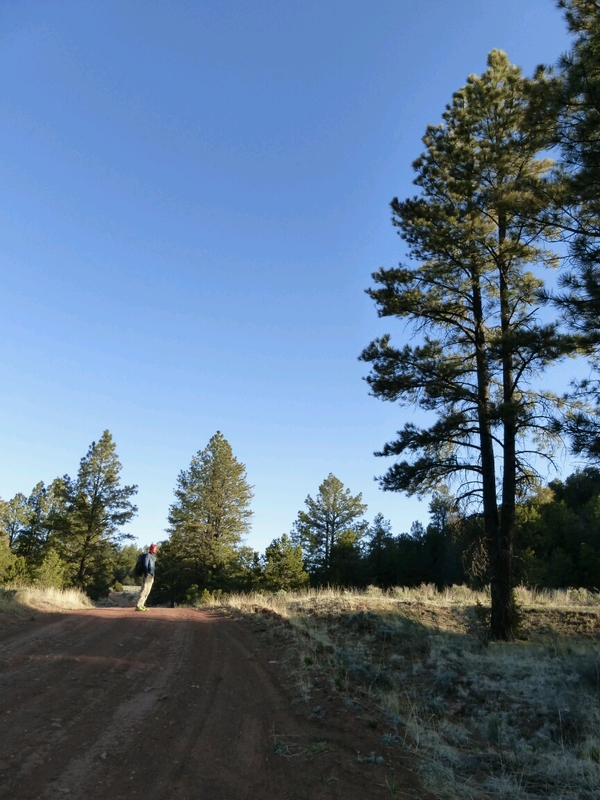 Only here in these Ponderosa- pinyon forests it is harder fir me to imagine what they once looked like. I long for a reference stand to better envision what a healthy northwestern New Mexico forest looks like. I don&apos;t understand the need to shoot signs. We hike on. Playing our new road walking “game” of noting the beer preferences of locales. Here, interestingly, there are lots more bottles. Regional preference? On sale? Why choose Bud Light over Coors Light or Keystone? Why drink light beer? At least I have read enough Ed Abbey to understand one reason (of many) to toss beer cans along the road. 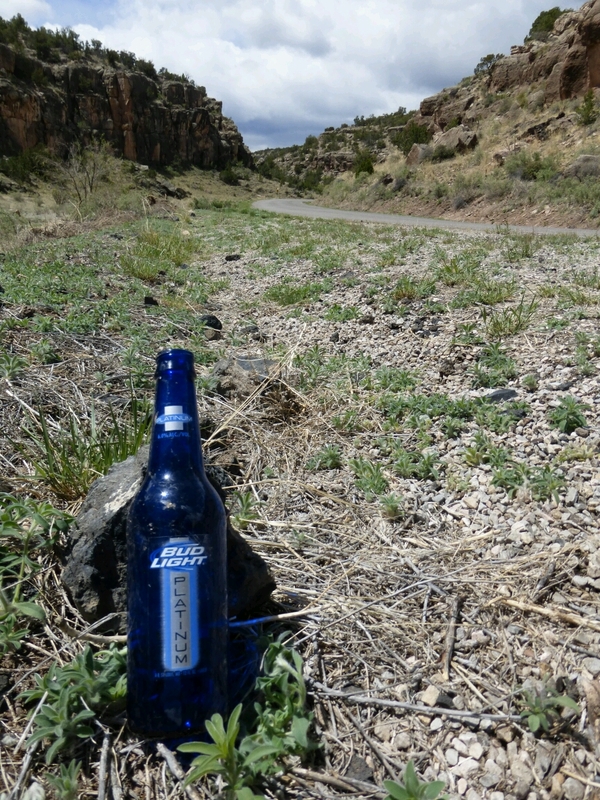 Gabriel has been especially amused by all the bottles and cans along the Zuni Canyon road. At the last roadside interpretive sign, a local driving up the canyon stopped to ask us if we were CDT hikers. (However could he tell?) I asked him for a recommendation of where to eat in Grants. No hesitation. Badlands Burgers! That settled it. Destination picked. Only 6+ miles and 2 hours to go. Finally in Grants. A little dazed from hunger and town bustle we made it to Badlands. Super nice. Great fries. 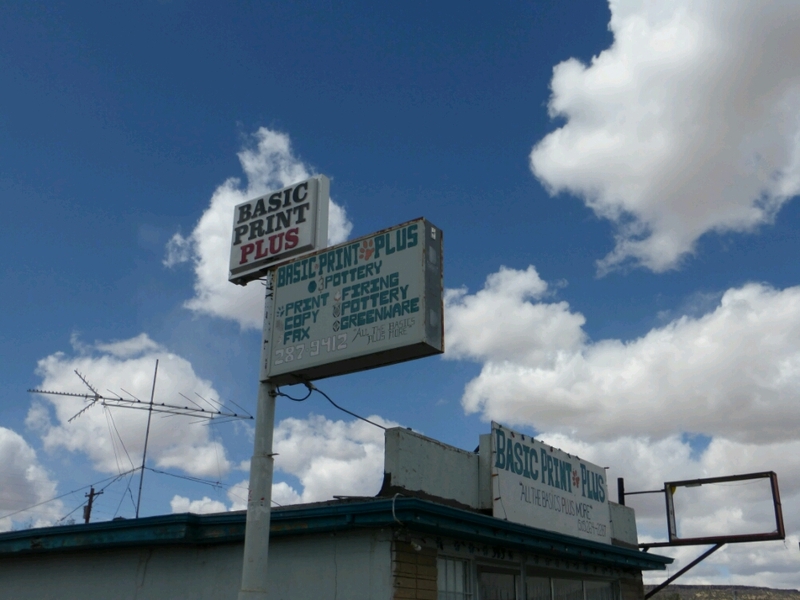 A nice family-run restaurant on Route 66. We enjoyed eating. Sitting. Warming up. Gabriel was finally full after two entrees and 1.5 milkshakes. 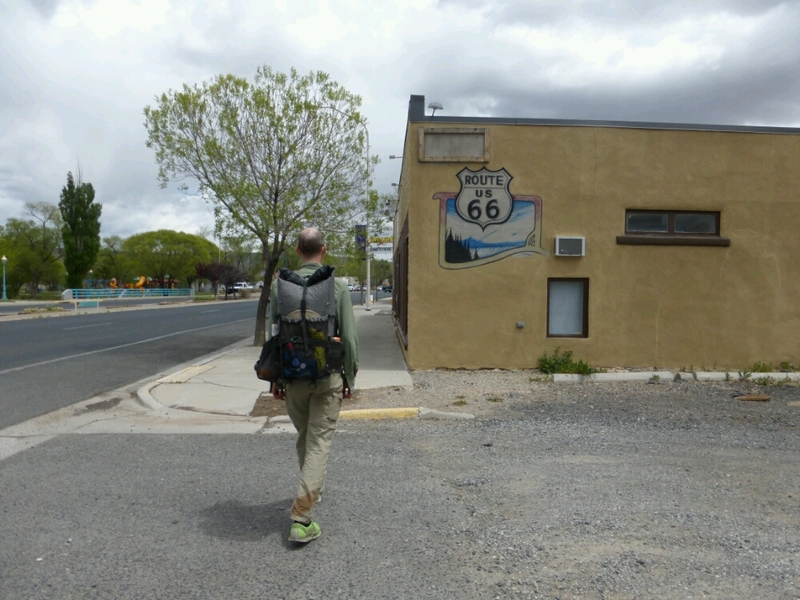 Getting our kicks on Route 66 and eager to get to food. Awesome poster at The Badlands. We&apos;ve walked from here to here! 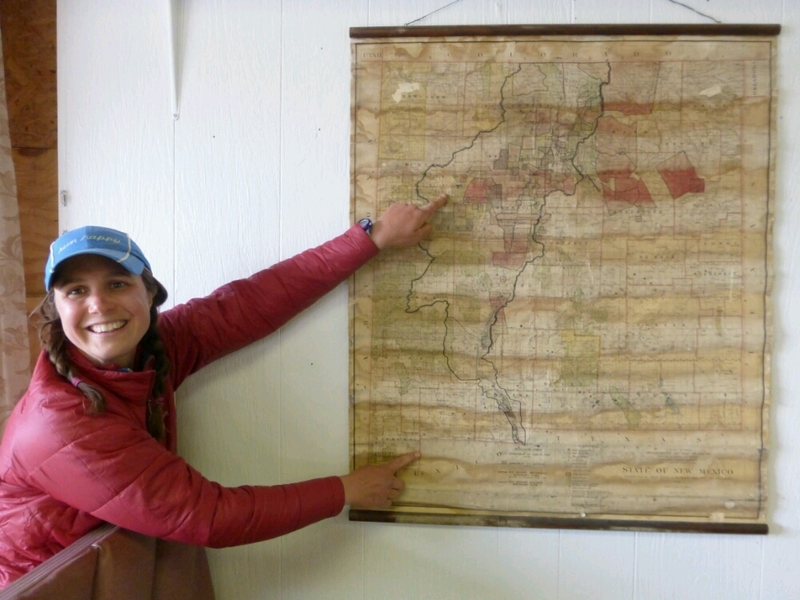 The restaurant owner&apos;s dad purchased the 1936 map at a garage sale. The map was four years older than him. His son thought it would be good for the restaurant and honor his dad. An amusing sign to the son of potters. 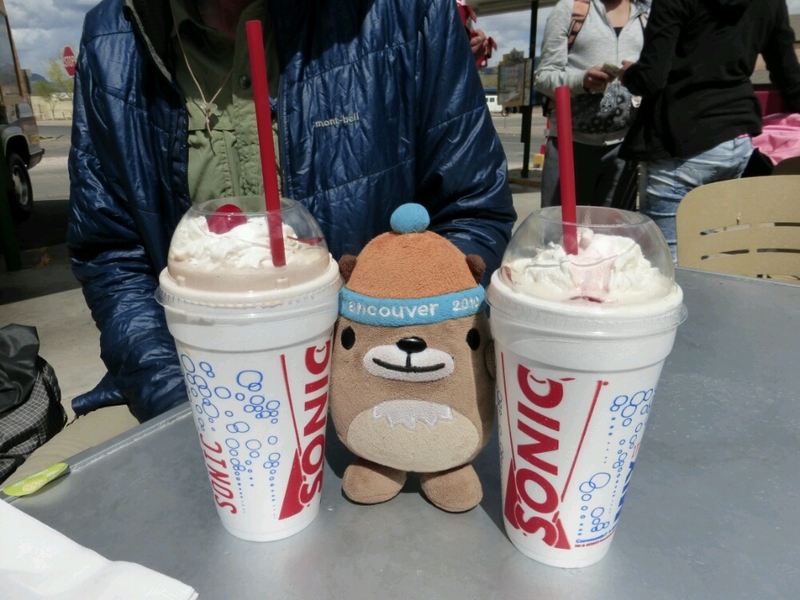 Mukmuk and our first milkshakes of the trail.